Volume 2: Last week I made my second pilgrimage to my home away from home, Portland OR. Land of the hipster, the weird, the accepting and the best artisanal/multicultural food in the United States, I hope to live there some day and took this trip to get a little more used to the place before making the jump. Check out Volume 1, Volume 3, and Volume 4 here. In the last episode of Keep Portland Weird, I visited a skatepark, a farmer's market, the smallest park in the world, did some shopping and hung out with Fruit Salad Club for a doodle and chat session. After walking all day yesterday, I decided to treat myself to the city's bikeshare program for the day. It's owned and operated by Nike, which causes some contention for some people as they believe Nike to be the rich monopolizer of creative talent in town. The campus is just outside of town, about a half hour by streetcar (gotta remember to check it out next time). Anyway, all the bikes are bright orange and pretty snazzy looking from a visual standpoint. Some of the bikes (maybe 1 in 20 that I noticed?) are special designs based on Nike shoes - like the Nike Air Safari bike. You can find the cool special bikes in their locator app, so they definitely want the user to have fun trying to ride all the different types of bikes. I actually think it's an amazing idea, and they could capitalize even further by providing users with a sort of digital passport to collect points for each type of bike they find or something. Some of the bikes are special bikes like this black one. Anyway my first bike ride of the day was around 8:30am to a cute little southern-style brunch place called Screen Door that specializes in praline candied bacon. Yep, you heard me right. I also got the biscuit with sausage gravy. I probably finished about 90% of the meal, it was astoundingly good and heavy. Magnetic North is a creative space for makers, doers, thinkers, and tinkerers. We value DIY aesthetics, hard work, high fives, and unbridled creativity. We thrive on late nights, early mornings, and everything in between. The vibe inside is pretty much exactly as that bio describes; super hip but not at all pretentious, and simply beaming with creativity and possibility, and there were only two other people there the first time I visited! Walker took me around the space and showed me all the wonderful tools they provide to their inhabitants, including a beautiful old letterpress machine. A lovely piece paying homage to Ladd's Addition, a neighbourhood just south of the studio. Each of the individual images in the piece were done by a different artist in the wayzgoose style. A map of Ladd's Addition. Walker told me about the excellent work that his co-manager Reid Psaltis is doing, having been trained at the Smithsonian Museum in casting replica animals for dioramas. He made this model of one of the first incarnations of horses! Also check out Reid's instagram. The space really reminded me of the fabrication studio at my university, except that I noted that none of the machines were digital. There may have been a printer or something hiding somewhere, but all I could see was screenprinting stuff, letterpress stuff, woodworking stuff, and the like. All delicious analog. Reminiscing about the lab at my university, I remember no one had been properly trained to use the digital stuff and it was always malfunctioning, so I figured it was for the best and kind of charming anyway. The workstation of Maggie Wauklyn, and her instagram. Walker's workspace, also super cool! I had such a lovely visit with Walker, and he invited me to come back the next day to see resident artist Vania Vananina's art show Dreams of Lasagna (more on that in the next post). We took a selfie with the bottle opener I brought him as a thank-you for letting me tour the space. From there, I walked across the street to grab a bike, and happily noticed that someone had sprinkled birdseed into the metal mesh baskets of all the bikes. No birds around at the moment, but still a nice thought. I biked down to SE Division Street and wandered eastbound along there, aiming for around SE 30th Avenue where the cool stores started one major block north on SE Hawthorne Street. This was pretty much right where Ladd's Addition is, so I biked around there and through the center where there is a lovely rose garden. I would come back here the next day. Right when I was about to turn left to get back to Hawthorne, I noticed another Food Truck pod. This one was more special-er than the large one I had seen the day before in SW, with fewer but higher-quality artisanal trucks. The space around the trucks was also really nice, with picnic benches, canopies and string fairy lights and basically space inside to hang out in the shade. Unfortunately it was around 10:45am so not many of them were open yet, and also the Screen Door breakfast was extremely large. So I looked around and then biked north to Hawthorne. A cool shop inside a double-decker bus! Not everything in the food pods is food. 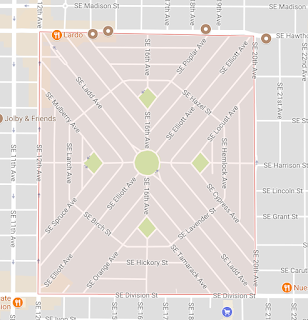 I parked my bike around SE 44th Ave and walked westward on Hawthorne. Lots of great shops along the stretch of street, with some really cool vintage furniture and clothing stores. Many stores had hand-picked thrift and would also buy your clothes, so like a more upscale Value Village. I had a very tasty cucumber tarragon ginger beer at a place that sells ginger beer on tap (would eat again) and finally decided to try Blue Star Donuts (even though I always believed Voodoo was the be-all-end-all of donuts). Oh my god they were amazing. I had an orange olive oil cake donut (cake donut or die) and it was freaking fantastic. I eventually tried Blue Star again the next day actually. Couldn't keep away. So many flavours of ginger beer!! A very cool vintage clothing store. So many velvet paintings of naked ladies! This was on top of the changerooms. Orange olive oil cake donut. Doesn't look like much here but this was freaking amazing. There was also a Powell's Books in this hood, which Walker had told me was actually much lovelier than the one in downtown, and he was right. Not only in Powell's Books but in all the gift shops, everything was lovingly curated and displayed so nicely. Here, all the space-themed gifts were displayed in such a balanced arrangement. They also carried Hershel's backpacks that flatpack down into nothing which was really cool. I might buy one online. I went into the first of what would eventually be four visits to various locations of an awesome store called Tender Loving Empire. Basically they sell lovely handmade gifts like enamel pins, wooden magnets, stylish postcards, artisan jewelry, etc, as well as records and CDs because they are also A RECORD LABEL. How cool is that! I found out all of this because I was walking around the store and really digging the music they were playing. I asked the shopkeeper what the band was, and she proceeded to tell me all the above information and that this musician, Dave Depper, was playing a $5 show THAT SAME NIGHT in a neighbourhood pretty close to where I was staying. It was insane. So I resolved that I would finally get to do my favourite thing while on vacation which is go and see live music. This was a double-decker bus that sold coffee and pastries. It says "To Richmond Hill" on the side! Soon enough it was time to bike over to Studio Noyes to hang out with the principal, Samantha. Their office is closer to the river in SE, very close to Burnside Skatepark, only one bridge-street (Morrison) south of there. It's still the same industrial hood though, and in fact very close to OMFG Co. who was regrettably unable to have me visit (though did send me a very nice email) and Fuzzco, who I would visit the next day. I toured Samantha's office a little, noting that it was small but very cool, the four of them sharing an open-concept studio with another company (with whom they collaborate as Samantha later told me). We took a walk through the neighbourhood to grab some coffee at a nearby cafe, all the while Samantha's coworker following us on his longboard as we chatted. It seemed like such a Portland thing to do. During Portland Design Week in April, they held a boxcar race! Samantha bloomed her early love of shoe design into what is now Studio Noyes, a team of four, all collaborating seamlessly on projects that bring them ever closer to creating the perfect footwear. And boy, do they come close. All of their projects show what a wonder it is to feel the intersection of form and function on one's foot. And of course, as I had already felt from looking at their work online, I was astounded at how niche their business is and how they do one specific thing very, very, very well. Not only that, but for four people to be able to find each other in the same place with the same intense and specific passion, and on top of that, to all want the same thing and complement each others' skills perfectly. It's truly a wonder. From SE Belmont, I took the Burnside Bridge across the river in the hopes of making it to the International Rose Test Garden, but I got so sweaty and burnt out that I had to stop and grab ice cream at Salt & Straw in NW (along NW 23rd Avenue) which was probably the worst one to go to - it had such a long line. It was all worthwhile though, because I had some of the most delicious flavours of ice cream I've ever had. They let me try SIX flavours (that's why the line is so long), and they were all amazing. I continued with my ice cream walking south along NW 23rd Avenue, but many shops did not allow ice cream (big surprise) so I did a bit of window shopping as I made my way toward Washington Park. This shop called The Meadow sold artisanal salts - yes those are slabs of Himalayan Pink Sea Salt! It was a long walk into the center of the park, so I was really happy to see that there is a free shuttle all around the main attractions of the huge park including the Oregon Zoo (hard pass), the Japanese Garden (no time unfortunately), and of course the rose garden. If you didn't know, Portland's city flower is the rose, and they have an annual rose festival every June (also on my list). This garden was nothing short of astounding. The roses were bigger than softballs, and every colour you could imagine. I gather this is where they grow the roses for the festival, plus lots of other competitions and events. It was extremely hot out, so I wandered around the garden for a while and then hopped on the shuttle to get back to SE Hawthorne to meet Carrie for dinner. I had a lovely chat with the shuttle bus driver, who is retired and volunteers to drive the shuttle around the park to meet tourists (so cute), and then walked the rest of the way to the nearest Biketown pod to grab a bike to Hawthorne. Here's a video of me unlocking the bike in the system! Just after I had crossed the Morrison bridge to get to SE, I went over an EXTREMELY LARGE pothole and my waterbottle jumped out of the basket. Luckily only one of the closing mechanisms broke so it still works, but wow I have never seen such a terrible pothole in such a busy area. I imagined I wasn't the first to succumb to the pothole, and I actually witnessed someone else do the same thing the next evening. This was pretty much rush hour and I still hadn't really seen many bikes around, which was good because my Toronto cycling skills allowed me to zip past all the cars (who were very polite and constantly gave me right of way even though it was theirs). I still had to budget my bike minutes to make it to the concert later that night, so I parked my bike at around SE 31st Avenue and did more window shopping as I walked to a vegan restaurant called Harlow at around SE 41st Avenue. Carrie and I ordered the same vegan mac and cheese, which was extremely delicious. I realized I hadn't really eaten much all day since breakfast except for the ginger beer, donut and ice cream, and had biked about 20km, so I was really pooped. Potato-dill vegetable soup that was insanely good. Carrie drove me back to her house after dinner, which I was EXTREMELY thankful for because the difference in land grade between SE and NE is extremely steep and winding as I mentioned earlier. I got home, prepped for my studio tours the next day, and headed out to grab a bike to get to the street where the concert was (N Mississippi Avenue). I had to walk kind of far (15 minutes) to get to the closest Biketown station with bikes in it (the app tells you how many bikes are in each station at the moment). There were closer stations but they had no bikes in them, which was unfortunate. That said, right beside the bike station was Pok Pok Noi, the delicious little offshoot of Pok Pok where my mom and I shared some fish sauce wings last time I was in Portland. I was still super full from the mac and cheese and wanted to come back later for some latenight wings, but they were only open until 10:00pm. This was Thursday - a school night - so I suppose that's to be expected. Biking at night through the mostly residential streets of Portland is not ideal. The Biketown bikes have lights on them, but I gather they're more for other motorists to see me and not for me to see the road in front of me. Streetlights on residential streets are quite few and far between, so I was hoping to god I wouldn't hit another pothole. I made it to N Mississippi Avenue in one piece and took in all the cool storefronts (mostly closed) on this stretch. It might actually be my favourite area of town. There were lots of open bars, including one beside the concert hall - Mississippi Studios - called Bar Bar, through which I entered the concert hall. I got there around 10:15, when the opener Radioid was playing. Their set was so good, I'd actually venture to say I liked them better than Dave Depper, who was also good. I was thankful that the venue had a dancefloor as well as a seated balcony, of which I made good use. Sitting after a long day of biking and walking in the sun was extremely nice. Dave Depper - my seated view was pretty good, right? The bar at Bar Bar. How cute. As I walked back to grab a bike to get home, I resolved to visit Mississippi Avenue the next day when the stores would be open. It's really such a cool area. If you've been keeping score at home, you may have a guess as to how much of the 180 biking minutes I used...as I locked the bike back into the station by Pok Pok Noi, the counter told me I had 4 minutes left. I'd say that was a good amount of biking. And no overages! Then I walked home, got into bed and passed out within a couple of minutes. It was a long day. That day I biked 27km (only slightly more than how much I walked the day before) but also walked 15km. 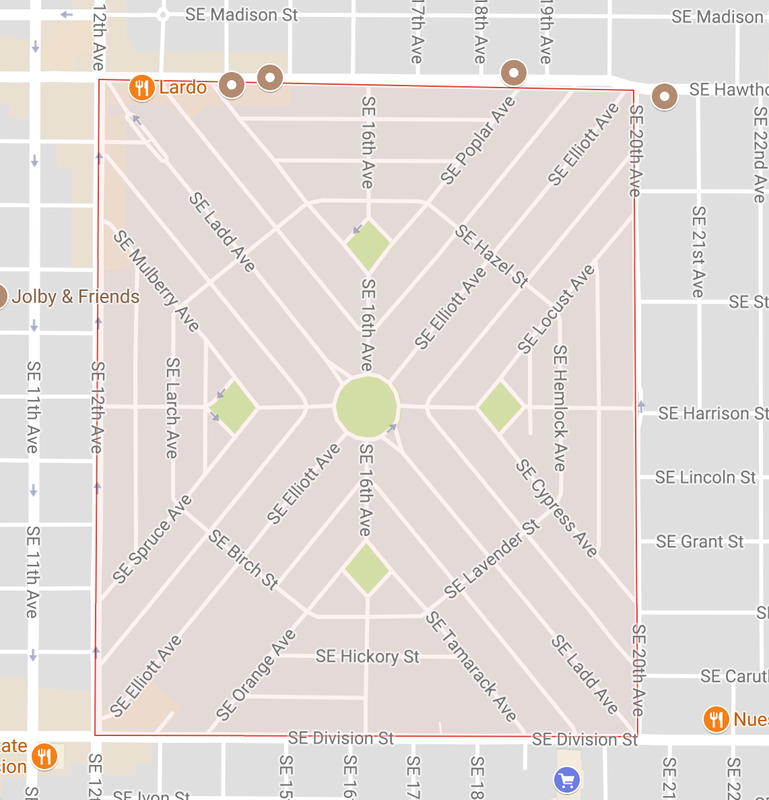 I visited all four quadrants of the city! On the next episode, I eat the most delicious breakfast sandwich in the world, go back to N Mississippi area for some spiritual tea, tacos and the store that sells nothing but light bulbs, and see an art exhibit involving collage and lasagna. Also, peanut butter poutine from the same place I got it in 2013! Stay tuned!